Composting with worms usually involves covering the bin to control moisture. Worms respond to their environment. If their world is too wet or too dry, they will be less productive and possibly even die. Composting with worms is a great way to turn kitchen and gardening scraps to into valuable fertilizer. One key to success is finding the best covering for your worm bin. Worm bins can be indoors or outdoors. Indoor composting systems are typically small, tray-based plastic composters, such as the Worm Factory 360 (which can also go outside). The Worm Farm Kit and bins made from plastic totes can be used indoors or outdoors. Outdoors composters can be tray-based, or large bins. These can be made from plastic, wooden pallets, lumber, or chicken wire. Indoor composters are not subject to the same temperature and humidity extremes as outdoor composters. 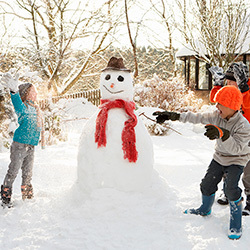 Homes have temperature control in the form of heating and air conditioning. They will stay as comfortable as you are. Indoor composters come with a plastic lid. This isolates any odors and helps deter insects such as fruit flies. The lid also helps to retain moisture and keep the bin temperature consistent. And it keeps the worm bin nice and dark, just the way the worms like it. The lid should be kept on at all times, except when feeding. An optional accessory for an indoor bin is a blanket on top of the bedding. The worm bedding should have the consistency of a wrung-out sponge. If the worm bin is drying out too often, a blanket helps hold in moisture. You can use several sections of newspaper soaked in water. Or, use a worm blanket made from jute. Jute worm blankets are all-natural, breathable and just the right thickness to hold in moisture. Some worm bins come with a blanket. If yours didn’t, you can purchase worm blankets at Uncle Jim’s Worm Farm, either when you order or as a separate item. 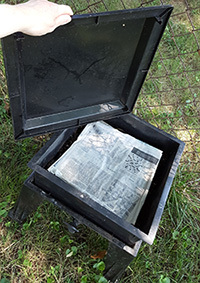 Place the newspaper or blanket on top of the bedding and scraps in the “working tray” of tray-based composting systems. Lift it for feedings, and lightly water it. Outdoor composters are especially in need of a solid lid. Rain can quickly stink up your bin and drown your worms. A home-made chicken wire composter is difficult to put a lid on. It is very open, so hopefully most of the excess water will drain away. A large, open composter made from lumber or wooden pallets might have enough drainage to not need a lid. If you can add a lid made from wood or plastic, do this. Large plastic composters from the local garden store will usually come with a lid. Totes come with a lid; rain barrels might. These can be adapted to make composters. Do not drill holes in the lid; holes should be drilled into the sides and bottom. 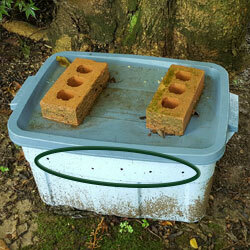 See instructions for making a composter from a tote. Uncle Jim’s Worm Kits each have a sturdy lid. Depending on the type of composter, you may also need to place your worm bin under shelter. The Worm Factory 360 can take on water in a heavy rain. An awning, shed roof, shelter or big tree usually provide enough protection from the rain. 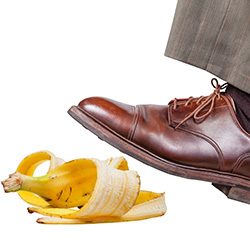 Some of the smaller composters can get battered around in a storm — if this is a possibility, put it in a sheltered area such as a walled patio or porch. Bungee cords can be used to keep the lid in place. Evaporation is a problem in the hot summer months. The lid helps keep the moisture in. If the bin dries out often, lightly sprinkling it with a watering can will help. Additionally, a worm blanket can be placed on top of the bedding. You can try using a few sections of wet newspaper. Uncle Jim’s Worm Farm carries a jute worm blanket that is just the right thickness to hold in moisture. It even has a convenient handle. Pull on the handle and lift the worm blanket to access the worms. Worm blankets need to be watered whenever you feed the worms. So long as the bedding has the consistency of a wrung-out sponge, you are doing it right. The best coverings for your outdoor worm bin are primarily a lid, and optionally, a worm blanket. Basic homemade bins that are exposed to the elements, such as chicken wire bins, are probably OK without a lid, but most vermicomposting bins need lids. Worm blankets provide extra protection against evaporation. Coverings protect the worms from the elements such as rain. They also keep the top of the bin dark, and worms like it dark. Keep your bin covered and keep your worms happy! 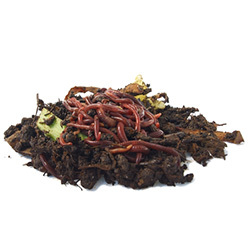 Uncle Jim’s Worm Farm ships high-quality live composting worms (Red Worms), as well as Super Reds (European Night Crawlers) and mealworms. I have just order the Worm Factory 360. I have a large evergreen I can put it under in my back yard. Can I use Grocery brown paper bags (double bagged) as a covering? Yes, they would be perfect. Just soak them in water first, then let the excess run out and keep an eye on them as they will dry out. The jute worm blanket in my outdoor worm farm has partly disintegrated so I can’t lift it to feed the worms. Are the worms eating it or do I need to remove it & replace it with a new one. Our worms eat every blanket we put it. We use cotton t-shirts,newspapers, brown paper bags/paper, and jute. My question is can linen be added as a blanket?